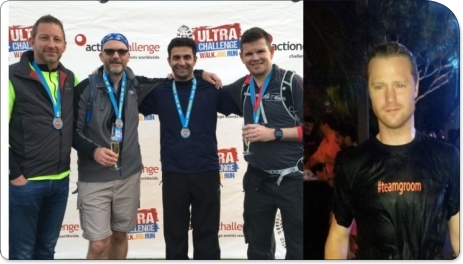 Run 4 Cancer News > The Musketeers take on the Ultra Challenge! The Run 4 Cancer Team Walk Again! 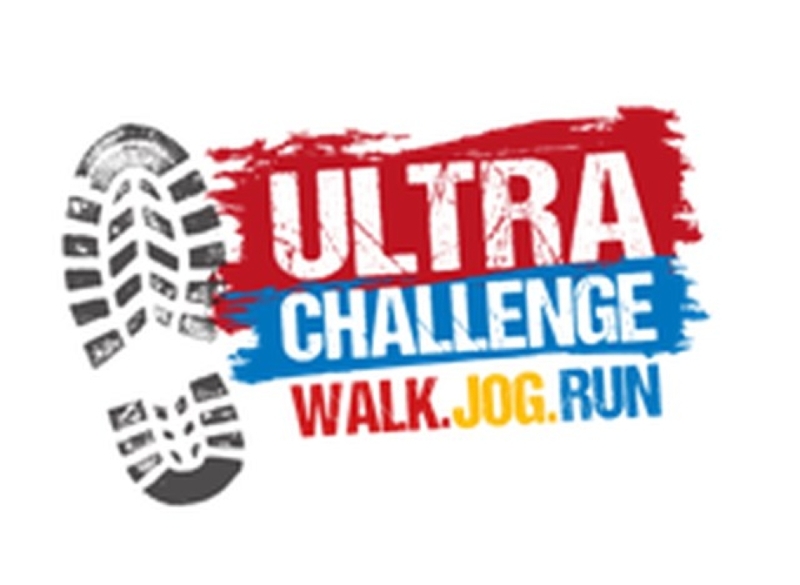 The Run 4 Cancer team get ready for the next leg of their Ultra walks - The South Downs Challenge! Over the weekend of 2nd/3rd July the trekkers completed the third leg of this unique challenge. In very hot conditions and with most of the group carrying injuries (the constant wear and tear taking it’s toll on everyone) the group set out from Hackney in East London (in the shadow of the inspiring Olympic Stadium) and made their way towards Cambridge. The route was flatter than previous events but the terrain was really rough on the feet and all the group suffered with blisters and impact damage from around the midway point. However, this didn’t stop the team and Martin absolutely smashed the course, completing it in his best ever time of 13 hours and 33 minutes - phenomenal! The rest of the group didn’t do too badly either all crossing the line together in a very respectable 21 hours and 10 minutes, meaning that all the group have finished every event within the target of 24 hours - a bacon sandwich and cup of tea at 6.30am on a Sunday morning has never tasted so good! 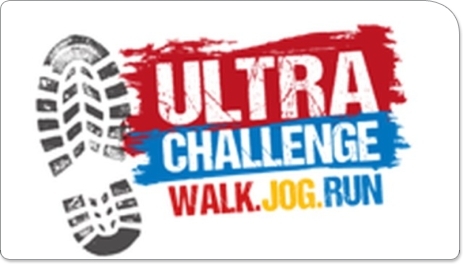 The next event is the extremely daunting South Coast Challenge over the bank holiday weekend of 27th/28th August. Starting in Eastbourne, the route follows the South Downs Way, taking in the infamous cliff top walk along the Seven Sisters. To say it’s a “hilly” course would be a major understatement - this is probably the toughest of all the challenges and with the weather forecasters predicting temperatures up in the high 20’s it’s going to be gruelling. The terrain is also very rough on the feet and joints consisting mainly of hard, chalky and uneven cliff paths. And this is just a warm up for the final challenge just 12 days later which is another 100 km from London to Henley following the river Thames. 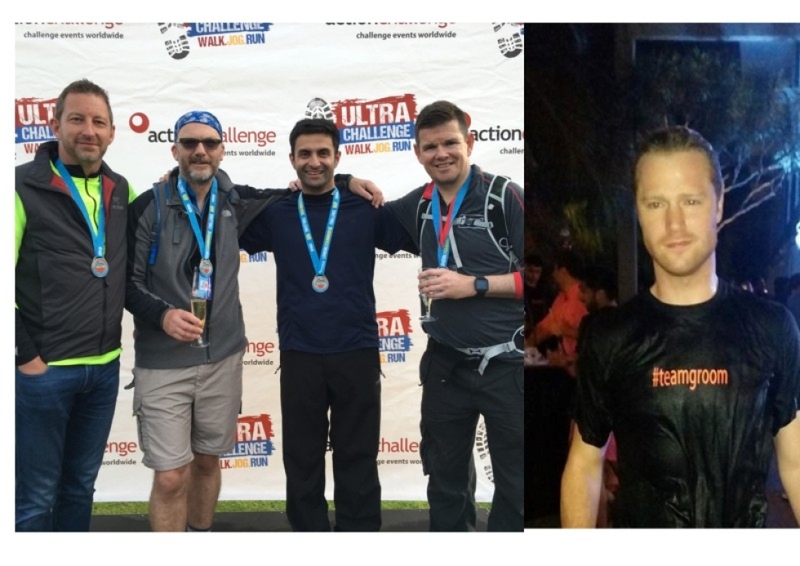 Donation Form : The Musketeers take on the Ultra Challenge! Great job, real dedication and a little bit of madness! Great cause and tremendous amount of commitment. Good luck guys. A good cause, well done to you all - take my hat off to you. Great cause and well done !!! Well done so far and best of look with the last one! Keep up the good work Sean, impressive stuff. Well done Robbie - hope you have lots of plasters! Well done Robbie 100km is a tough call! Great cause. Great effort guys and all for a great cause, well done! Good luck Sean and the team. Thank you to all the staff at Bristol for selecting Run for Cancer as "charity of the week"... And for organising a cake sale to help raise additional funds. Donated by generous West Ham fans-you know who you are! Ta for the support-means a lot from the Hammers family! Keep on going guys I wish I could! Good luck to Sugar Sean Donovan. You'll be ready to do 10 rounds with me when you're finished! Good luck Musketeers from NFU Mutual. Chets and guys fantastic achievement and congrats on passing the line. That's one amazing will power u all have. We really proud of u. Steve,Vee, Kye and Reid. Instead of dragging Chris, hopefully this and other donations will propel him towards the finish and help achieve the objective. Good luck! Have to say this is a massive challenge and now you are half way. Rest needed before round 3 but an absolutely fabulous effort so far. Well done and keep going! Good luck and well done so far!!!!! Fantastic work guys! You will smash it! Well done to you all. Personally I don't think Chris's feet were in that bad a state after your first walk -so I am expecting more pain on the second one!! You Must be Mad ! Well done guys, massive challenge for a great cause. Wish you all the best for each event. Good luck gents! Great cause! Great effort guys and for such a fantastic cause. Well done. Great challenge, well done guys! Well done for the Isle of Wight and good luck for the next 4! Great effort guys, very impressed! Hope the weather holds - good luck guys! Good work boys - from Dave, Sophia and Cora!! Walk Forrest! Walk! Hope goes well Sean (and others). Enjoy! Go guys. Hats off to you all. Good luck guys! A fantastic effort for a fantastic cause! Good Luck Chaps, you will smash it!!! A massive thanks to everyone who have already given generously and to everyone who haven’t yet please do and help us to make a difference. Good luck chaps, a fantastic effort for a very worthy cause. Best Friend is just starting Chemo - good luck chaps - great charity! Well done guys! Great cause. All the best. Best of luck Chris! From everyone in Tiverton. Good luck guys - fingers crossed for the weather! Here's the kick off donation to get the ball rolling!